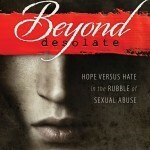 One of BMH Book’s newest releases, Beyond Desolate: Hope Versus Hate in the Rubble of Sexual Abuse, was featured during the national conference of the Fellowship of Grace Brethren Churches last week in southern California. This important new resource for victims of sexual abuse and those who would help them uses the biblical story of Tamar, who was raped by her brother, as the starting point for a penetrating and insightful look at the elements of recovery and re-institution of hope. The authors, Tammy Schultz, Ph.D., and Hannah Estabrook, M.A., are themselves both victims of sexual abuse and work in the therapeutic community. Schultz is a professor, speaker and counselor and was awarded the 2010 Indiana Counselor of the Year by the Indiana Counseling Association. Estabrook holds the master’s degree in counseling from Grace College, Winona Lake, Ind., and is the co-founder of AVAH! Ministries, which provides womens’ seminars on body image, sexuality, friendship, and other topics. She is based in Columbus, Ohio. Beyond Desolate is a 342-page paperback which is heavily footnoted and resourced. Each chapter contains “Discussion Starter” questions for use by therapists, in support groups, or for individual reflection. A “How to Use This Book” section gives 14 specific suggestions on how to utilize the book and to extend its ministry to help the hurting.